Events section for exact dates and location. Did you miss the last meeting? Here's a recap of the previous Club Meetings. Each month, the club tries to schedule a training session of some kind, often with guest presenters from the local breweries. There are also lot's of homebrews to sample. Remember, you can often learn a lot more from the bad beers you make, than the good ones. So bring em in and share. There are many experienced brewers to discuss the pros and cons of your beer. 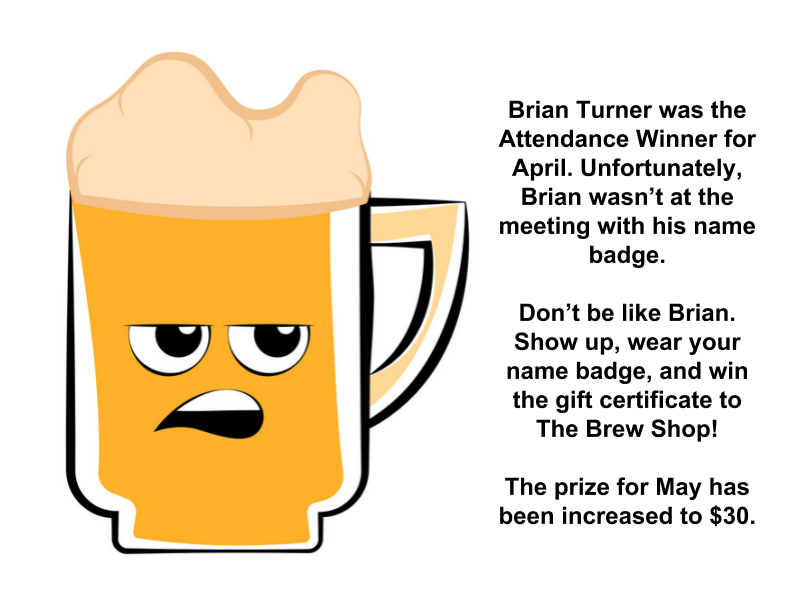 Check out the beer-related blog sites on our link page! Registration is open for our annual competition, Spring Fling! This year's dates are Friday, April 26 through Sunday, April 28, and entries are due by April 10. Now is the time to sign up and start brewing your best beer for the competition! The comp is open to all beer, mead, and cider represented in the 2015 BJCP Style Guidelines. All entries must be in 12-ounce or 350ml crown-capped bottles, no swing-tops. Attach bottle labels with rubber bands only; DO NOT tape or glue labels to the bottle! Entry fee is $7 per entry. Register your account and submit your entries on the Spring Fling website. The Brew Shop will be the drop-off point for registered beers. Brewers may enter more than one beer in each category but may enter each subcategory only once. We will be judging on Friday and Saturday, April 26 and 27, and the Best of Show and the Awards Ceremony will be held Sunday the 28th at Aspen Ridge. And as always we will need volunteers for judging, stewarding, food, and admin -- we'll be talking it up and recruiting at our monthly meetings. Our May Club Competition will be for BCJP style category 10, German Wheat Beer. There are three sub-styles in this category: 10A Weissbier, 10B Dunkles Weissbier, and 10C Weizenbock. These wheat ales can be pale or dark and should contain that distinctive banana and clove yeast character appropriate to the style. Entries due by Saturday, May 4 at The Brew Shop. In 1988, May 7 was announced before Congress as National Homebrew Day. The American Homebrewers Association (AHA) created Big Brew as an annual event to celebrate National Homebrew Day around the world. Big Brew is held each year on the first Saturday in May. More details to follow! Mark your calendars -- on May 19, Monkless Belgian Ales will be holding a fundraiser for COHO! Details to come. New website Feature! You can now upload the photos that you take at club events to the club for use on our Website, Facebook Page, and slideshows at club meetings. Use our amazon affiliate link when shopping on amazon to support our club! Members ! See Our Guidelines for the Group Brews here! Please read COHO's policy on Marijuana here! Dedicated to the appreciation and education of fine fermented beverages!